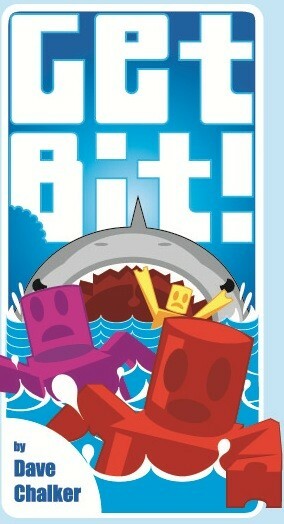 Game Night Blog Carnival: Get Bit! This post is a part of the Game Night Blog Carnival, dedicated to games you can play when your full RPG group isn’t available. Playing D&D, particularly 4E, can be hard. There are many variables to track, abilities to remember, and tactics to discuss. From time to time, it’s good to step back and relax a little. Playing a quick, simple game with friends can be a good way to unwind, and Get Bit! is one of my favorite such games at the moment. Get Bit! was designed by Dave Chalker, of Critical Hits fame. The theme is quite fun: you control a colorful robot, who has gone for a swim for some inexplicable reason. I suppose these robots are so advanced that they do not rust or malfunction when wet. As you might surmise from the title, the splashing group of robots attracts a hungry shark, who doesn’t know the difference between steel and human flesh, apparently. The robots make a nice, neat line and try to swim away to escape. It’s silly, yes, but that just adds to the fun. Each turn, you will secretly choose a card, numbered from one to seven, to reveal. Starting with the lowest number, players move their robots to the front of the line. Thus, to make sure you aren’t last in line (and thus bitten by the shark), you’ll want to play higher numbers. But if you play the same card as another player, neither of you move. This adds an interesting bluffing element that I really enjoyed. The last thing that happens each round is the robot at the back of the line loses a limb. Pulling an arm or leg off the adorable robots is quite fun. As small consolation, the player who got bit is able to take back all previously cards into his or her hand. So, the more you lose, the better your odds are to have a good card to play, a nice balancing feature. Play continues in this manner until a robot loses its last limb, whereupon the robot at the front of the line wins the game. It’s one of the most lighthearted and laughter-inducing games I’ve played this year. The appeal of the plastic robots and their easily removable limbs cannot be denied; many times, the game slows down to a halt as you put the robots in all sorts of cool poses. 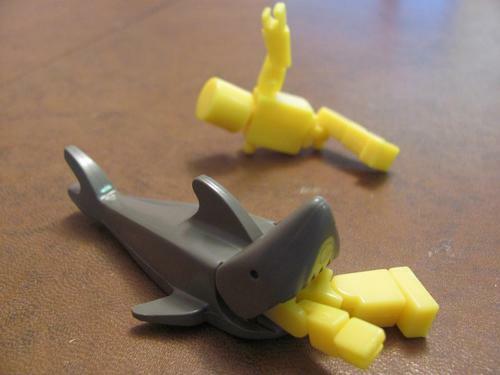 Even after a game is finished, you’ll want to fiddle with them, playing with the interchangable parts and acting out scenes from Jaws. The component quality in general is very good, with a sturdy box and thick cards in addition to the awesome robots. One of the best things about Get Bit! is the flexibility built into the rules. There are different versions of the game for small groups as well as large ones. I backed the game on Kickstarter, so we have a copy of the 7th player Sharkspansion, which allows you to play as Mr. Teeth himself. The gameplay is simple enough to play with children, and they will love the LEGO-like components; my son will sometimes get into the box just to play with the robots! I highly recommend Get Bit! It’s a nice change of pace from a serious session of D&D or more cerebral board game fare. Sometimes, you just want to shove your friend in front of the gaping, serrated maw of nature’s deadliest predator, and this game allows you to do just that, in between snacking on Chex Mix and downing root beer. Check out the rest of this month’s Game Night Blog Carnival entries here. Next Should DMs Be Responsible for Character Generation?